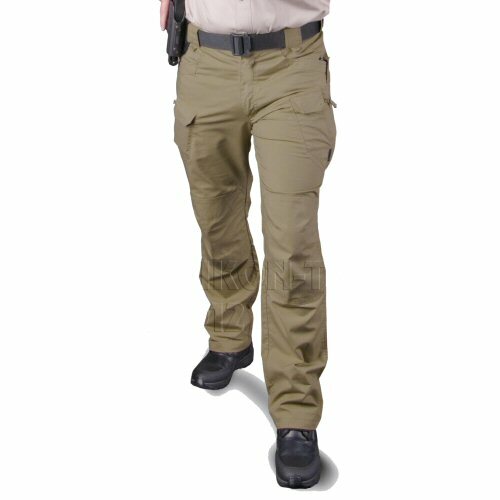 The Helikon UTP tactical trousers are an advanced fit trousers offering excellent features and flex for movement. UTP is from Helikon's vanguard Urban Tactical Line of clothing, designed for security, tactical and sports use where a professional appearance is a must. 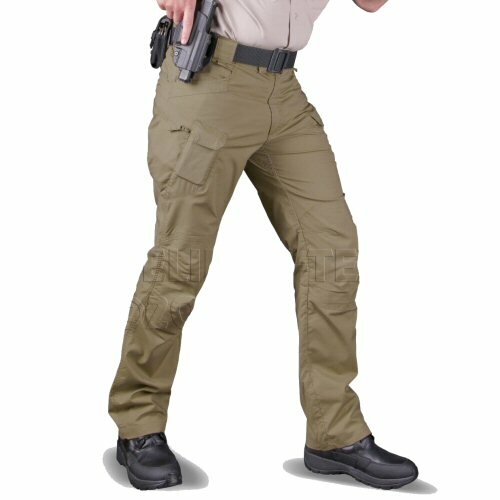 The trousers are made from 97% Cotton and 3% Spandex material, allowing for extra body movement such as when carrying out human defence and restraint manoeuvres. The trousers are designed with a two way self-adjusting comfort waist elastic with additional velcro hook and loop patch on front of waist to allow the wearer to fully adjust the trousers to fit. The knees feature double layer reinforced and shaped protection area with internal pocket for knee pads. 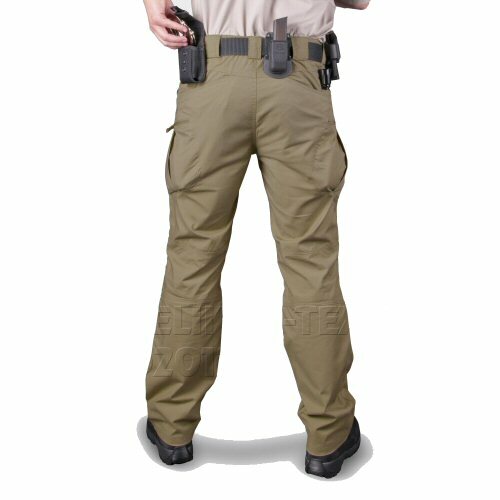 The trousers feature extra wide belt loops for included duty belt, rear slant pockets, slanted cargo pockets which are pleated for expansion and closed with zipper, hip pockets with reinforced section for clipping in penknives, torches, multitools and mobile phones, mobile phone pockets closed separately with velcro on the front of both cargo pockets, extra torch or tool pouch mounted in each rear slant pocket toward the side of the body. A loop of material is sewn just under each front belt loop which allows for a lanyard to be attached to the trousers. Zip fly from YKK completes the trouser. 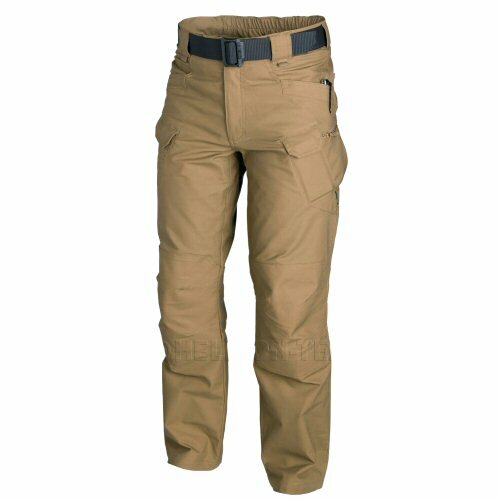 The UTP tactical trousers solve the problem of freedom of movement and a good fitting trousers without an excess of material and are ideal for wearing with leg rigs, knee pads and any other additional items as required. Sizes are shown in inches, waist-inside leg. If your size is not shown, please email as we can special order extra sizes. Please note accessories are shown for illustration purposes only and are not included with the trousers. This is for the coyote brown canvas trousers. Trousers do not include waist belt shown in the picture. Available options are: 32-32 , 34-32 , 34-34 , 36-32 , 36-34 , 38-32 , 38-34 , 40-32 , 40-34 . The trousers offer an excellent range of unimpeded movement, even when in stressed positions. The trousers are reinforced and constructed to expand on the knees for positive movement. The rear of trousers. Note that the wide belt loops can help position and space items on the duty belt and prevent side to side riding. The leg pockets are positioned so as to present a less bulgy profile, even when loaded.